ZTE's Nubia brand has launched the second iteration of its gaming smartphone dubbed Red Magic Mars. The device is built on its predecessor success, and in this regard shared some of the first generation specifications. It however brings new hardware to the table; these includes a more powerful processor, upgraded RAM and storage option, and a more enhanced cooling system. The Red Magic Mars is powered by a Snapdragon 845 processor, a notable upgrade from the Snapdragon 835 that powered the earlier model. Moreover, this also comes with up to 10GB of RAM and up to 256GB of internal storage. Heat is dissipated by the liquid and air dual cooling system. According to Nubia, the new cooling system lowers the temperature by 13.2-degree. There are more additions that made the phone stand out; it is the first Android gaming phone to runs Android 9.0 Pie out-of-the-box, buttered with Redmagic OS. Also, it have two new touch-sensitive shoulder buttons in addition to the volume up/down, power, and the dedicated gameboost buttons, that provide users more control over gameplay. The RGB LED strip still resides at the back for lighting effects, but the rear camera has been downgraded to 16MP f/1.8 sensor (from 24MP f/1.7 sensor on the Red Magic). Sitting below the camera at the back is a fingerprint sensor for biometric security. At the front of the Nubia Red Magic Mars is an 8MP camera with an f/2.0 aperture, with face unlock baked inside. Other features worth mentioning are 4D Gaming that uses a real-time scene detection to offer subtle haptic that go in rhythm with the gameplay, and stereo speakers with wide DTS 7.1 surround sound. 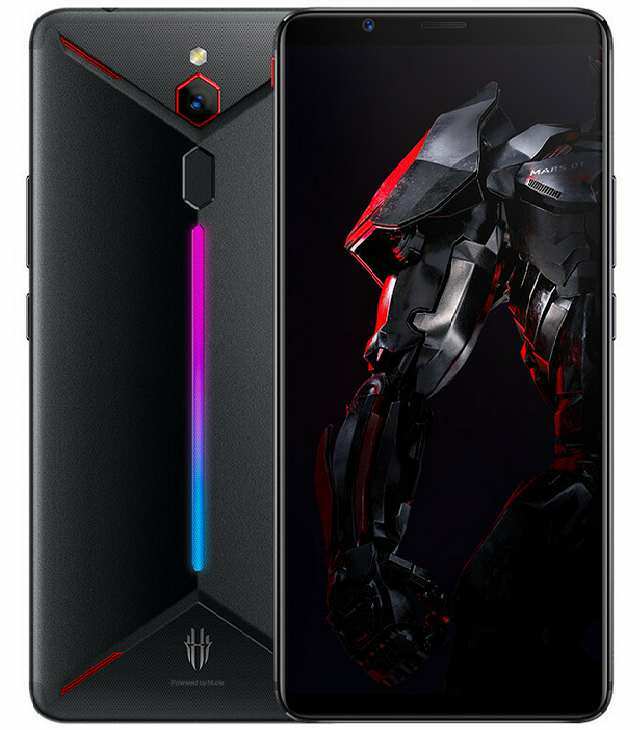 The gaming device has a 6.0-inch Full HD+ 18:9 IPS display, it is powered by a 3800mAh battery with fast charging supports. The new Nubia gaming phone lacked a 3.5mm audio jack unlike its predecessor - optional accessories will be made available, however. These includes Bluetooth-connected gaming controllers and 3.5mm/USB-C charging combo box with DAC. Update: The phone do indeed have a 3.5mm audio jack as opposed to our earlier report. Sorry for the confusion. The 6GB/64GB and 8GB/128GB versions priced at CNY 2699 ($388 USD) and CNY 3199 ($460 USD) respectively, comes in Meteorite Black and Flame Red colors; while the 10GB/256GB version is themed in Camouflage and is priced at CNY 3999 ($575 USD). Sales begin on December 7th, but you can pre-order from today.